Happy Friday! This week's NYC Friday series brings us to Jacques Torres. Jacques Torres, also known as "Mr. Chocolate," is a master pastry chef. He worked with a Michelin chef in Nice, taught in Cannes, and was the Corporate Pastry Chef for the Ritz-Carlton. In addition to being a James Beard Foundation winner, he was the youngest person ever to win the prestigious Meilleurs Ouvriers de France (MOF), a remarkable achievement. (Check out the documentary Kings of Pastry for more on the MOF.) Jacques Torres now runs a chocolate factory, retail shops, and an ice cream shop in New York. During law school, I learned about his chocolate chip cookies while searching through Google's 9.28 million results for the best chocolate chip cookie recipe. Jacques Torres' chocolate chip cookie recipe was completely different from anything that I tried, and it received rave reviews from my study group. When I studied for the bar, my sweet friend in NY sent me study treats from Jacques Torres. After trying the amazing recipe and chocolates, I knew that visiting Jacques Torres' chocolate shop was a must during my New York visit! During my NYC week end, I visited Jacques Torres' chocolate shop in Chelsea Market and in the Upper West Side. His shop shelves are full of such whimsical creations, along with handmade chocolate bon bons, truffles, and chocolate bars. As you stroll the shop, you can smell the aroma of the exquisite chocolate. And, you can even enjoy hot chocolate and a warm cookie as you shop. It was such a happy place to visit, and I loved seeing all of the creative chocolate creations. Now, with a name of "Mr. Chocolate," you expect nothing but a big chocolatey chocolate chip cookie. And, Mr. Chocolate delivers! 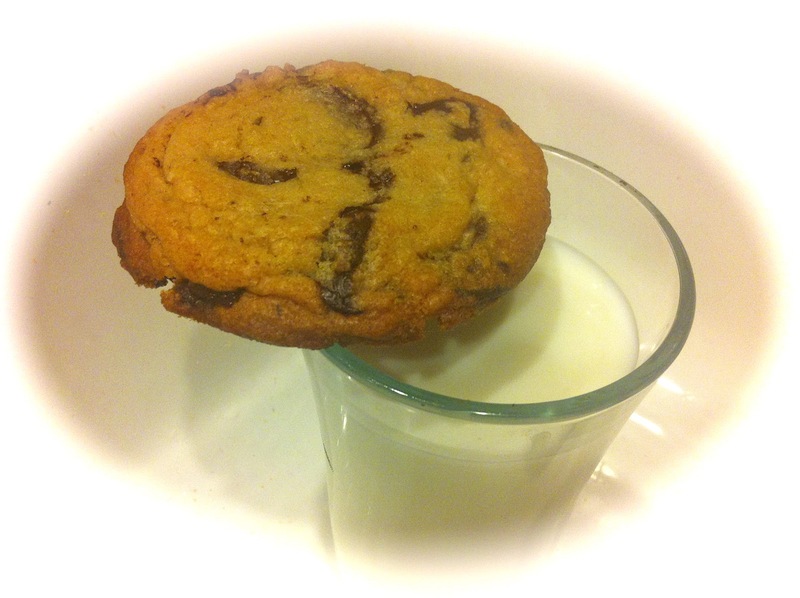 Jacques Torres' chocolate chip cookie pays wonderful homage to the main ingredient. I tried one of these cookies and then bought chocolate from the shop so that I could make the cookies at home! 1) Chocolate disks. The cookies use chocolate disks, which are larger than chocolate chips, and this allows for chocolate to permeate every part of the cookies. These are special cookies, so go all out and use good chocolate here! 2) Two types of flour. Bread flour and cake flour are used instead of all-purpose flour. Bread flour has a higher protein level than all-purpose flour. When flour has more protein, it has more gluten, which results in a stronger rise and a chewier item. Bread flour is used for bread because it creates chewiness, and by using bread flour in cookies, it creates an extra chewy effect. Cake flour is the opposite. It is much softer in texture, and it almost feels light and airy. It is perfect for cakes because it gives that tender crumb. However, cake flour and bread flour balance each other when paired, producing a perfectly chewy cookie with the right amount of crisp. 3) Refrigeration. The dough should be refrigerated for at least 36 hours (up to 72 hours). Refrigerating dough results in cookies that spread less when baking. Additionally, cookies stay puffier when the dough has been chilled. Most importantly, by refrigerating the dough for a few days, the dough becomes sweet and buttery. 4) Sugar ratio. The cookies have a higher ration of brown sugar to granulated sugar. Brown sugar absorbs moisture, so the cookies get softer--rather than dry out--as time passes. When I made these cookies, people loved the massive amounts of chocolate and thought the salt helped richen the flavor. This recipe is a keeper! Enjoy the happiness of a chocolate chip cookie with this recipe. Sift flours, baking soda, baking powder, and salt into a medium sized bowl, and set aside. Using a stand mixer fitted with the paddle attachment, cream the butter and sugars together until very light, about 5 minutes. Add the eggs, one at a time, mixing well after each addition. Stir in the vanilla extract. Reduce speed to low, and add the dry ingredients and mix until just combined for about 5 to 10 seconds. Drop the chocolate pieces in and incorporate them without breaking. Press plastic wrap against the dough, and refrigerate for at least 36 hours. The dough can be refrigerated for up to 72 hours. When ready to bake, preheat oven to 350ºF. 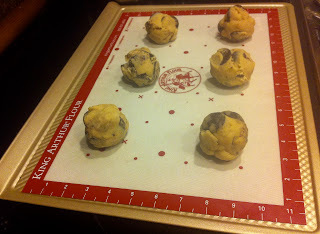 Line a baking sheet with parchment paper or a nonstick baking mat, and set aside. Scoop 6 3.5 oz. mounds of dough (about golf ball size) onto the baking sheet. Be sure to turn horizontally any chocolate pieces that are poking up. Sprinkle lightly with sea salt, and bake until golden brown yet soft, 18 to 20 minutes. Transfer sheet to a wire rack for 10 minutes, and then slip cookies onto another rack to cool more. Repeat with remaining dough, or reserve dough in the refrigerator, for baking remaining batches the next day. Eat warm with a glass of milk! *Note: You can use chocolate chips but try to find larger chips (such as Ghiradelli). Eat warm with a glass of milk. Is that like when you're 18 and you have cramps from hell and have a quart of milk and a whole package of Oreos? These cookies sound really good.